Outset has been dropping tons of great videos lately, and the latest is of young Chi rider Kuba Klimczuk. He's the first rider to be officially added to Outset's radar, and he deserves it! Kuba keeps it simple and stylish, and he's progressing super fast. He definitely took me by surprise with a few of these clips. Also a mainstay of being a pro rider: sitting around. So we all know there's no point in scootering unless you're sponsored. Sponsored riders live a glamorous, exciting lifestyle, full of free scooter parts, discount codes, the occasional riding trip and struggling to pay rent. Now, you may think that reaching that highest echelon of riding is near impossible, but today I am going to give you the keys to becoming sponsored (it’s easier than you think!). Instagram is the best way to get noticed these days. It used to be you got sponsored by working for months to make a compilation of your best tricks across a variety of parks and street spots. Today, all you have to do is hand your homie your phone and get a few bangers at the local, maybe with a hype, overblown rap song on top of it. If you accidentally film a clip on a real camera, simply record the clip off the LCD, straight to your phone. Don’t forget to tag your favorite riders/team managers in your clips so they can see how good you are! 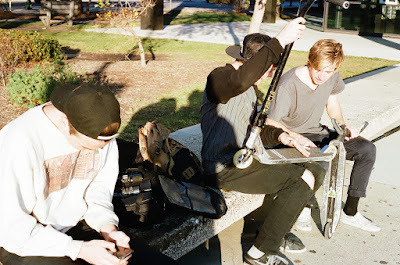 Observe Alec (left) Instagramming to get his rep up, while Charlie (middle) and Jack (right, sponsored) discuss how much they can sell their used parts for to the 10 year olds at the local. You can skip the whole filming an Instagram clip thing by going straight to the source- DM’ing your favorite company with reasons why you should be “sponcered.” List out where you live, what your setup is, and all the tricks you can do. What they really love is when it’s a DM to multiple companies- that really personalizes it for the brands to let them know how special you think they are. 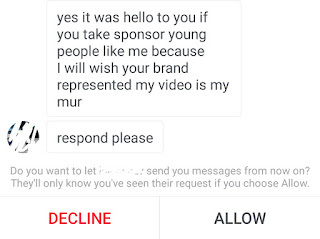 This technique first involves forgetting about being sponsored. All you have to do is focus on having fun scootering, and pushing yourself to progress your tricks and style. By riding for yourself, your own style will shine through, setting yourself apart from the rest. Show the dedication you have to scootering by filming full parts, and being a contributing member of the community. 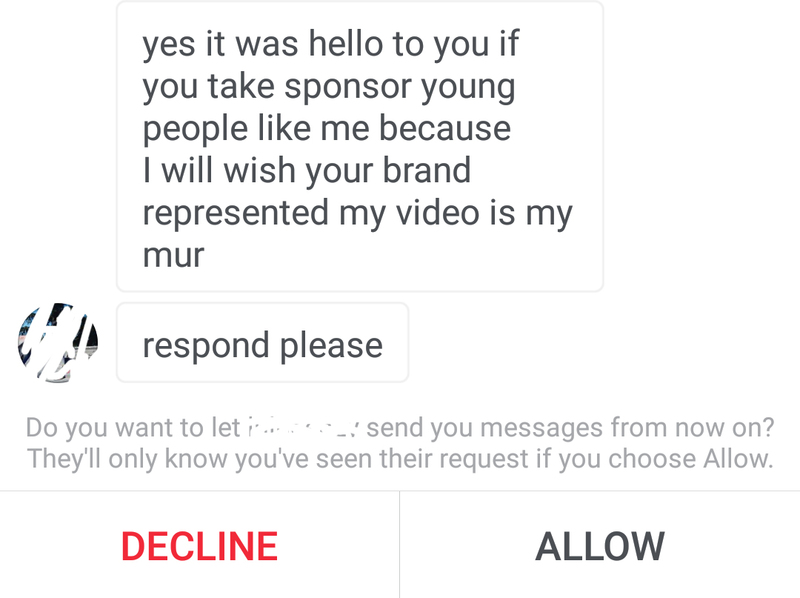 Brands will then take notice and may decide to get you involved in their sponsorship programs. Good god, this was insane. Didine Terchague and Jonathan Perroni are two of the most talented and skilled riders out there. They teamed up with Roots Boy to produce this amazing park edit. Speed, creativity, rail tech, big combo transfers, ledge wizardry, these guys have it all. Be prepared to hit rewind again and again on this one. 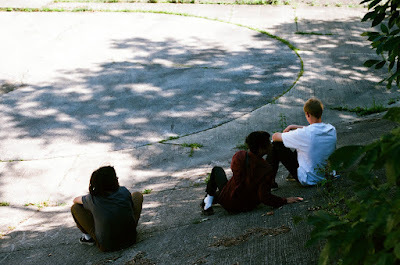 The premiere of Bay Area Concrete/Hella Grip's collab full length "Hella Good Stuff" is only weeks away. This trailer is definitely bringing the hype, great shots and great scootering from these guys. Premiere is August 20th in Oceanside, California, ya'll best make it to see what is clearly gonna be one of the sickest scooter films ever. Outset Select hooked up scootering's rising stars the Gridboyz with a DVX to use during their recent stay at Woodward. Ryan Fleet, Henry Rohlfing, Greg Sekeres, Kuba Klimczuk, Ryan Ruegg, and Sid Quamme are all featured cruising the wooden and concrete playgrounds. Cooper's birthday was a couple days ago, and he blessed us with this rad edit! Coop is one of the best shredders in the truest sense of the word- able to hit whatever you put in front of him, whether its a ledge, a handrail, or a gnarly bowl. Ender is one of the coolest enders I've seen in a while! 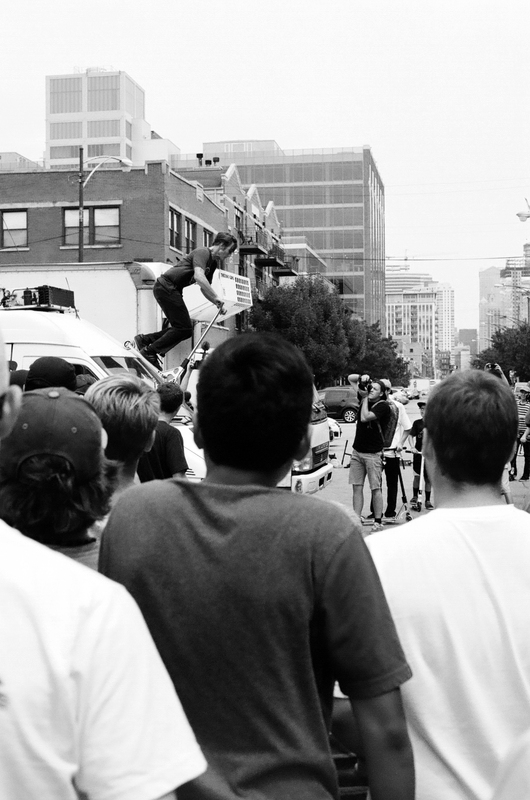 Street Jam Season is now upon us as summer gears into full force. These warm months mark the time where our community comes together to hang out, shred, and make a few memories in various cities across the country. With so many street jams happening the past couple years, I thought it might be prudent to put together a list of the Do’s and Don’ts of a Street Jam. 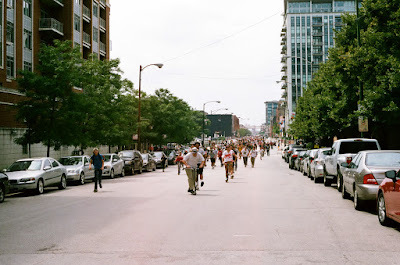 So read on to find out how to make the most out of your street jam trips. If this year is going to be your first time at a street jam, there are a few things you’ll need to keep in mind to be prepared. First, you’ll want to be sure you know how exactly you’re getting to the meetup spot of the jam- because the group waits for no one. Last thing you want is to miss half the jam because you didn’t make it to your train on time! Next, you’ll want to be ready to be pushing a lot- so pack light. It’s a good idea to bring a bag, but don’t stuff it full of spare parts/tools unless you really need em. Don’t forget water! Do: Document as much as you want. Don’t: Forget to have a good time! It’s a given that you’ll be wanting to Instagram and Snapchat your favorite moments from the day- the insane rail trick that your favorite pro landed, the gap you pushed yourself to hit for the first time, or when your homie ate it going over a crack in the road. But 1. Don’t forget to live in the moment and experience things firsthand, not through a lens! And 2. Try not to get in the way of the “official” photographers and videographers. 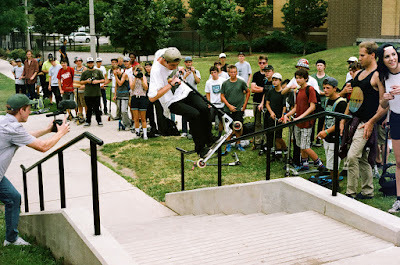 I know at the Chicago Jam there will be paid filmers and photographers capturing the event, so be careful not to get in their shot! It’s a stressful job documenting a street jam, and the video/pictures will end up even better if they don’t need to worry about finding an angle without a bunch of kids’ phones in the way. It can be intimidating to hit spots during a street jam, especially at the bigger ones. A competitive environment can develop, and younger/inexperienced riders might be a little shy on hitting their feeble downside whip when pros are doing back noseblunt whips. However, everyone deserves to have a chance to shred, so go for it! But remember to take turns, don’t snake anyone, try not to immediately one up your homie, and be aware of your surroundings. Do: Take time to appreciate the local culture. Don’t: Wander too far from the group. If you’re traveling far for a street jam, you should take some time out to experience what that city is all about. Don’t just eat at McDonald’s, try some of the local cuisine, or catch a glimpse of the local sights. I’d recommend waiting til after the jam is over to do so though, because you don’t want to get separated from the group. Cruising around the city with your crew after the jam is over, finding fresh spots and stacking clips is a must as well. Looking for a street jam near you? Below are a few of the street jams coming up, let me know if there are more that should be added to the list! Mike is a lowkey shredder from the East Coast who was recently put on Downside's US squad. He displays some great style and creativity as he puts his mark on those grimey East Coast spots in this video. Loved the manual 5050 heel rotor, so smooth! Chill vibes from this edit, this is someone to look out for in the future. Hunter will always be one of the burliest dudes to touch a scooter. This 7 minute edit contains his craziest scoot manuevers yet. There's a ton of Euro spots being decimated by this guy and I'm glad to see him get picked up by AO! Flavor's team keeps getting more stacked, and the latest addition is none other than Brisbane's Nathan Fleming. This dude kills it with an awesome style and the tricks to match. His rail skills are top notch and I loved the lines he threw. Trick at 1:19 was super nice. I don't know why everyone in Australia is so good at inside 50s, but I'm diggin it for sure. Great job on the film/edit by Jordan Turner.